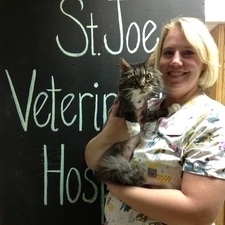 Dr. Rita (Jung) Johnson is a native of Evansville, IN and actually worked here at St Joe Vet before attending veterinary school. At Purdue, she pursued small, large and exotic animal medicine. She previously worked in emergency and exotic medicine in Louisville, KY and a mixed animal practice in Floyds Knobs, IN. She has a special interest in preventative health care, the prevention of zoonotic diseases (diseases passed from animals to people) and the human-animal bond. Dr. Johnsons free time is spent involved in outdoor activities with her husband, two rowdy kiddos, and a mischievious Belgian Malinois (Maya). Dr. Amanda Kline is a native of Henderson, KY. She graduated from St Georges University. She has a special interest in surgery. She is great asset to our practice and has a gift of putting people at ease. Her baby boy keeps her busy these days. She enjoys travel and family, gardening and most outdoor activities. Jeep riding with her husband is a top summertime activity. 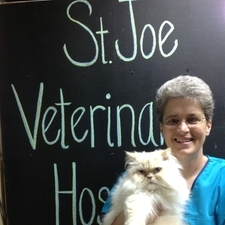 Judy has seen St Joe Vet Hospital through many changes since joining the practice in 1985. The value of her experience with people and pets is unmeasurable. Judy is our practical joker, so keep an eye out for her. When not following her daughter's activities, she is likely to be discussing Purdue sports, walking her Australian Shepherd Dixie, or brushing her cat Jubil (who refuses to groom himself). She also loves gardening, fishing, the Yankees & Packers! She has two grandkids that keep her & her husband busy at Holiday World on her day off. Ashley has worked in animal care for many years prior to pursuing her fitness career. She came back to us because she missed veterinary medicine so much and we are very happy to have her back! She will often be that smiling face welcoming you in the door, but really she is a "jack of all trades" and pops up in multiple areas of the hospital. Her return has really rounded out our animal care team! Ashley spends her free time with her husband and son, their pup Scooter and cats. Of course, Ashley still spends much of her free time at the gym. Don't let her tiny stature fool you. She's the strongest one in the building! Julia is a native of Evansville and a graduate of Reitz Class '02. She went straight to Purdue and graduated with a Bachelor of Science in both Animal Agribusiness and Veterinary Technology in 2008. Julia's husband is a wildlife biologist and she has two sons to keep her on her toes. The rest of the family is filled with their German Wirehaired Pointer named Ziba and 2 cats, Stanley, and Wesley. She enjoys time with family and friends, cooking, boating and reading. 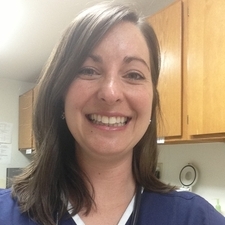 Jessi has worked in animal care for many years with both large and small animal patients. Jessi is a native westsider and graduate of Reitz High School. Jessi spends her free time with her husband and son at sporting events. The remainder of her free time is with her pets; dogs Chewie & Bo, cats Dave, Fat Cat, Momma Cat, and Whitey. She also has horses, a donkey and chickens to keep her busy. 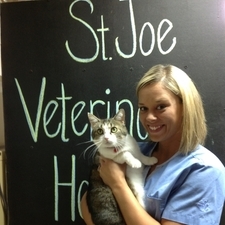 Sarah is a registered veterinary technician born and raised in Evansville. She graduated from Murray State University in May of 2016 with a Bachelor of Science in Veterinary Technology, then immediately started her career here. She first fell in love with St Joe Vet during her internship in the summer of 2015. She has special interests in rehabilitation and dentistry. She enjoys spending free time with her cats, Heather & Tessa and her dog, Bailey. She is also one of the most positive people you will meet and can put anyone in a better mood. Addie is a Purdue Bachelor of Science graduate of the Veterinary Technology program. She is originially from Muncie, IN and moved to Evansville in 2014. She is excellent with patients and clients. She enjoys spending her free time outdoors with her pups, Chance & Evee! She also has a rabbit named Whiskey and a Chinese water dragon named Chakra. Addie also enjoys reading, playing cards, kayaking and wineries! She also has the gift of adding joy to your day. We are so happy and lucky to have her! Katie is one of the smiles at our reception desk. She is a great asset for our office. 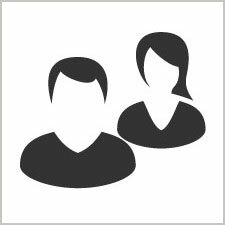 She is excellent with clients, an amazing multi-tasker, and has great follow through with questions and concerns for the clients behalf. We are better at office communication because of Katie. Katie's free time is spent parading her kids around to soccer, baseball and softball games and pampering her four-legged kiddos; pup Macy, and cats Max, & Marley. Katlyn is at Murray State University as a PreVeterinary Student. She has been a kennel assistant for several years since first job-shadowing for a high school class. She is back here to work at every school break and some weekends. She has a cat named Kimber, that she lovingly calls "little football." Shelby is another smiling face at our reception area. She is great at answering questions and can go from reception to technician in an instant if needed. Shelby is only here a few days week because she is busy raising a sweet baby girl! Shelby has background in private practice and in emergency work. Being so well-rounded is a great asset to our team. Virginia is a high school student at FJ Reitz High School and interested in a career in veterinary medicine. She helps support our technicians with the treatment and care of all of our boarding and hospitalized patients. She is active in 4H with her dogs; Buddy & Indy. And Buddy just won Grand Champion in Showmanship this at the fair! Elise attends Reitz High School and the Medical Professions Academy. She has goals of pursuing veterinary medicine as a career. She assists our animal care team and nurses with taking care of our boarding and hospitalized patients. Elise is a very competitive swimmer and will be in the pool if she is not at school or work. The also enjoys reading and playing with her pets; dogs Lucy & Rosie, cats Lily & Daisy, hedgehog Henry, and sugar gliders Sammie & Maya.